My new Weekly Indicator post is up at XE.com. Several important recent negative trends appear to be moderating. There are some possible explanations. Many of those who signed up for private health insurance under the Affordable Care Act did not do so until March and did not become covered until April or May. It could make sense for such people to defer some health care until they were covered. That may have been what happened in 1965, the other year when health care spending declined in a quarter. That occurred while Congress was passing the legislation that established Medicare, beginning in 1966. There were large increases in health care spending after Medicare went into effect. The report goes on to note that there is some evidence that weakness in health care spending carried over into the second quarter. We'll start to see for real in a couple of weeks. 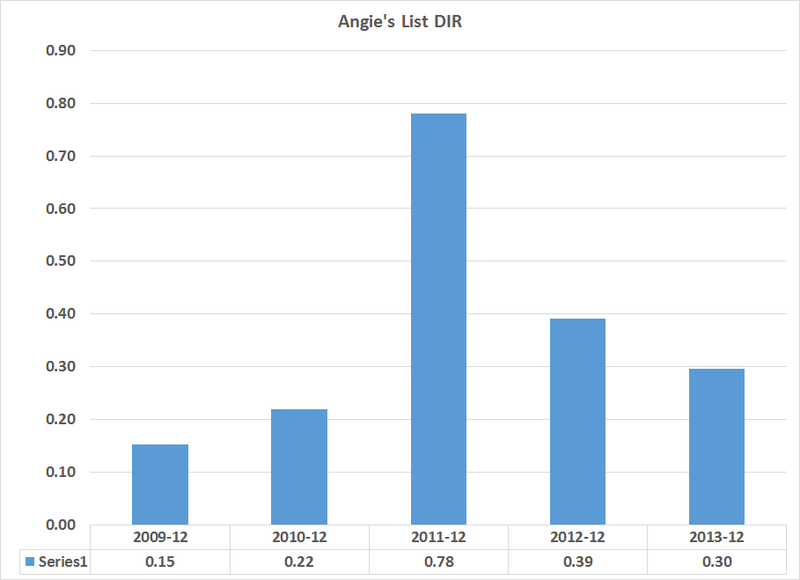 The DIR has never been above 1 in the last five years. In fact, it's been below .4 80% of the time. In the event all revenue stopped coming in, the company would be in very deep trouble very quickly. 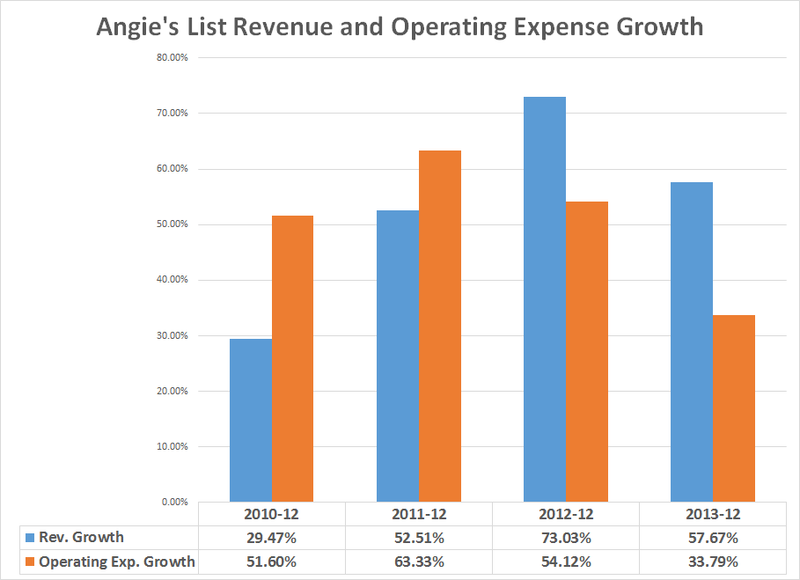 In 2010 and 2011 operating expenses were growing faster than revenue growth. And not by a small amount. They were 22.13% higher in 2010 and 10.82% higher in 2011. And while they were at least growing below revenue growth in 2012 and 2013, they were still growing at very quick rates. 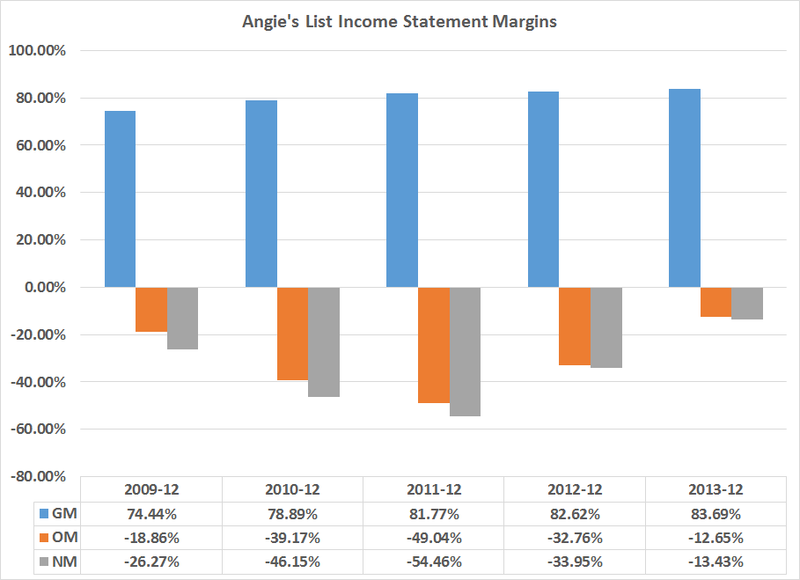 An argument could be made that my observations are based more on looking at Angie's List through the eyes of someone who prefers more established company financials rather than growth company financials. This is a valid criticism. However, the above financials are a total wreck; should growth slow, the company would face a cash shortfall quickly. And given their poor net income situation, financing would be difficult to obtain on favorable terms. The first metric a bank or credit analyst would look at is their liquidity ratios, and they would not like what they saw. And, to top it off, the insiders are dumping the stock. That's a terrible sign; if there's anybody who should know the company, it's the people running it. And they're leaving the stock as fast as they can. 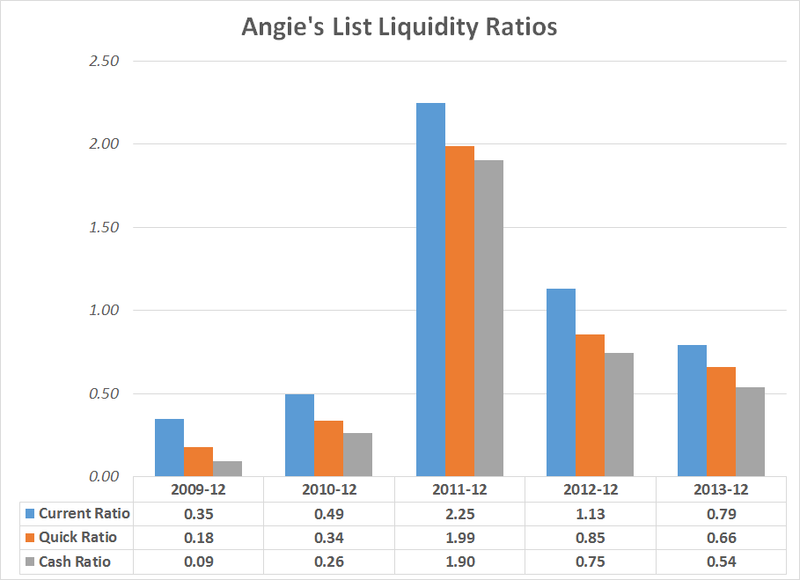 The bottom line is clear: Angie's List is not well run. And the insiders obviously agree with that as they're getting out of the stock as fast as they can. Above is a scatterplot comparing the year over year percentage change in seasonally adjusted average hourly earnings of "non-supervisory" employees and the Y/Y rate of change in CPI. 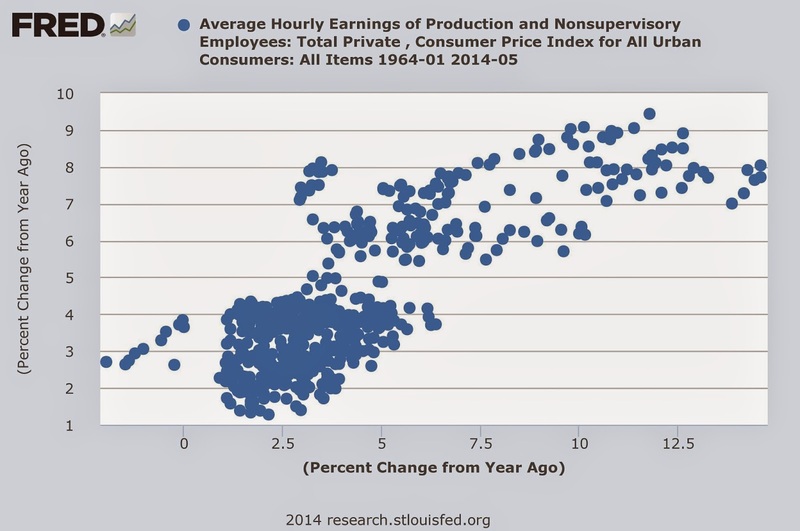 Notice the positive correlation: when wages increase at a higher rate year over year, CPI is likely to follow. 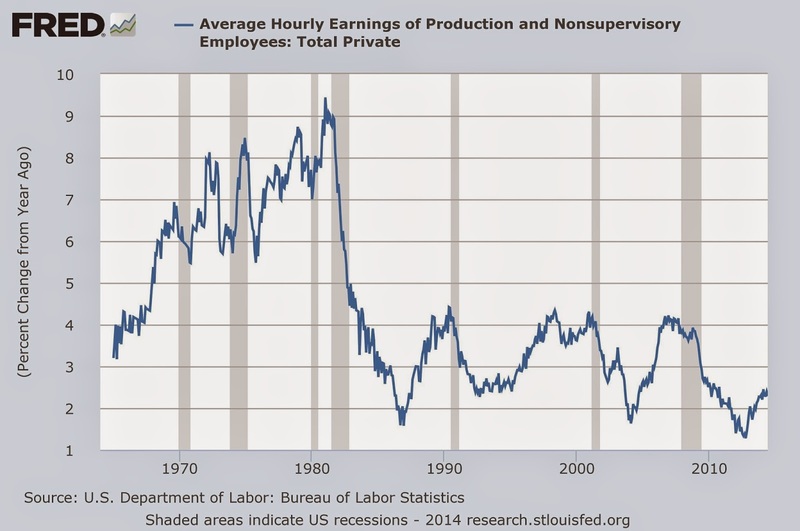 Right now, the average hourly earnings of non-supervisory workers is low by historical standards, indicating that we can expect weaker pressure on prices from this data set. I have a new post up at XE.com, updating a graph I have periodically run showing how the population adjusted rate of initial jobless claims leads the unemployment rate. It appears that an unemployment rate at long last under 6% is in prospect in the next few months. A really good friend of mine used to love his Blackberry. In fact, he called it is "crackerry" because he couldn't put it down. This was about 3 years ago, and, over that time, we've seen the strong rise of Apple and Samsung as the emerging companies in the cell phone market. But recent price action of BBRY has been positive, indicating the market is taking a second look at this company. Here we clearly see the fall from investor grace, as the stock traded from the upper 70s to now a price around 10. However, since mid-2012, the stock has been building a very strong technical base, consolidating losses. 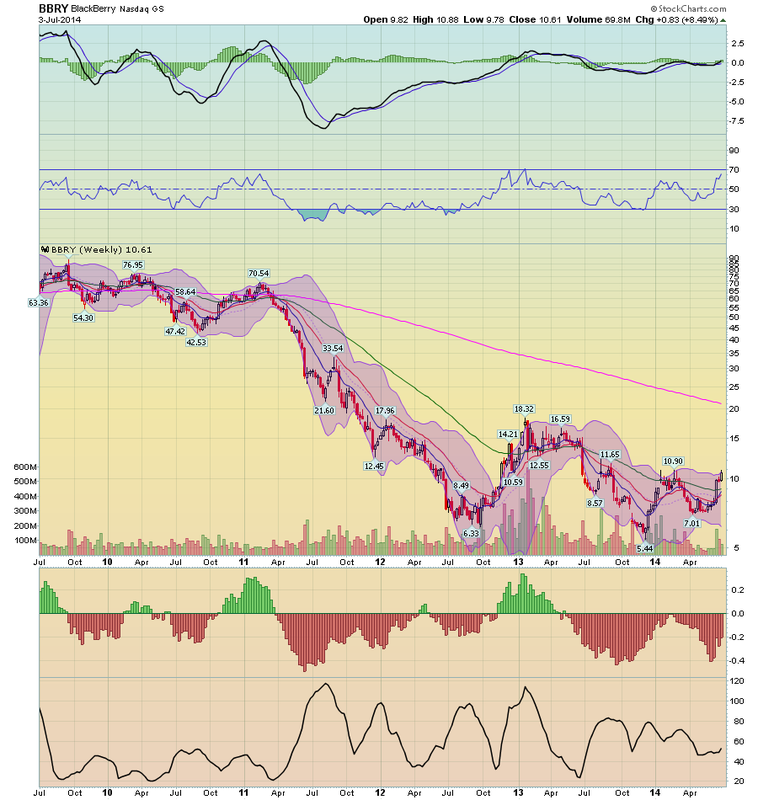 In addition, it has rallied two times from the mid level of $5 and $6 share. All of the charts below are from the last 5 quarters of financial information. 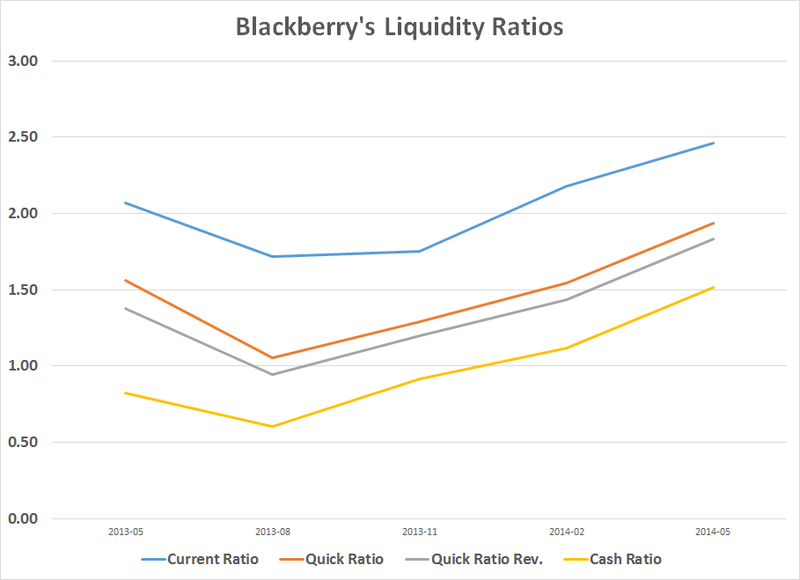 All of Blackberry's short term liquidity ratios are rising. The current ratio is now slightly below 2.5 while the cash ratio is 1.52. Also note the revised quick ratio where I assume receivables are sold at 75% of reported value is rising as well. Current management has done very well in creating a highly liquid company in a very difficult environment. Their defensive interval ratio is also in very good shape. 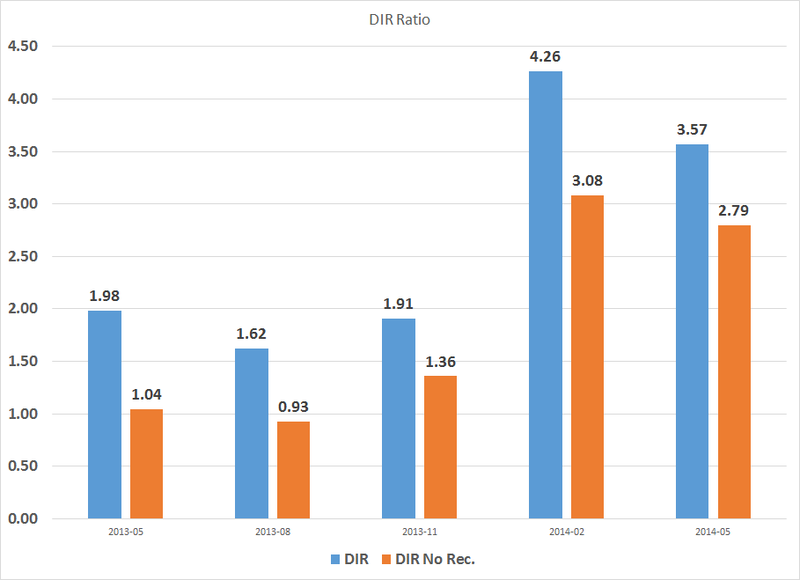 The DIR is a ratio of cash, cash equivalents and receivables to COGS, SGA and R&D expenditures. What we want to make sure of is the company has enough cash on hand to cover expenses. Notice that this number has been increasing. The gold column is a ratio that excludes receivables. The last two quarterly readings have been around 3, which tells us the company is extremely liquid. 1.) To extend an increasing amount of credit to customers thereby closing sales that are on weaker financial footing. 2.) To get caught with a large amount of inventory on their books as a result of declining sales. 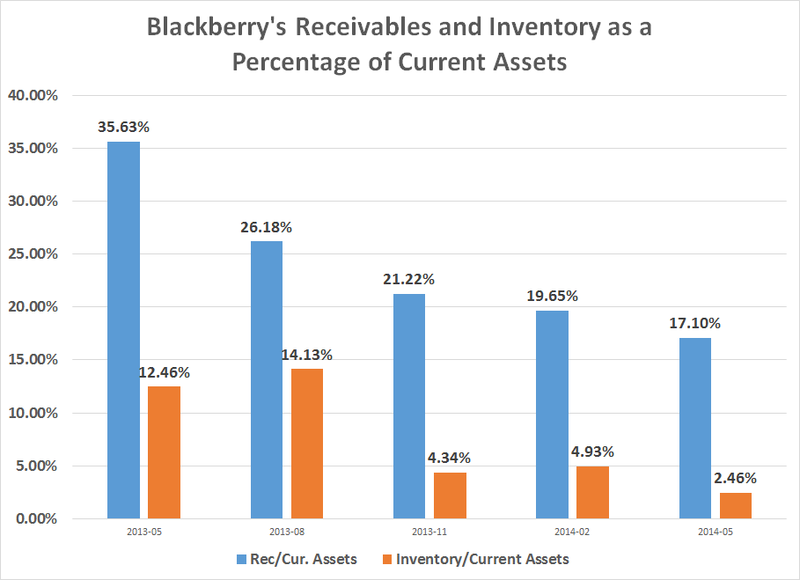 Receivables as a percent of current assets have decreased from 35.63% to 17.10%, while inventory as a percent of current assets has decreased from 12.46% to 2.46%. 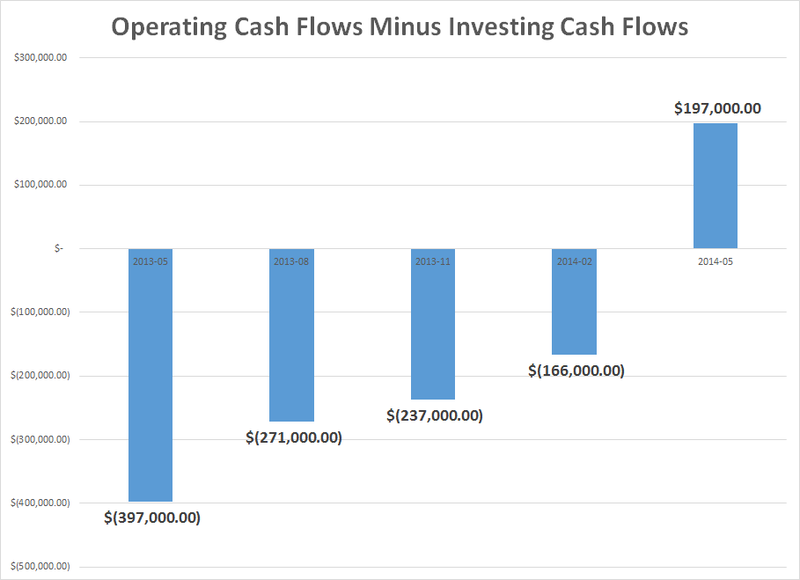 The point of this metric is to determine if the company is generating sufficient cash flows to cover their investments. If this number is positive, the company begins to have more financing options, allowing it to choose between different methods of raising capital. As the chart above shows, this number has been increasing consistently over the last five quarters, turning positive in the last quarter. None of this takes away from the daunting task facing the company. Quarterly gross revenue has dropped from a little over $3 billion to $966 million. Book value has been cut by 2/3, falling from $9 billion to $3 billion. And that's before we get into the difficulty of re-establishing a brand against two tech giants in Samsung and Apple. However, the above data indicates that at least financially, the company is in good hands. Representatives and direct Taxes shall be apportioned among the several States which may be included within this Union, according to their respective Numbers, which shall be determined by adding to the whole Number of free Persons, including those bound to Service for a Term of Years, and excludingIndians not taxed, three fifths of all other Persons. Thus from 1789 until the Civil War, the rural South was overrepresented in the House of Representatives, and had extra influence in the Electoral College, because whites were able to "represent" African slaves. This clause came to mind because of the acute crisis of 52,000 Latino children having been captured this year attempting to illegally cross the US border. The 10 million+ illegal immigrants (or undocumented workers depending on your persuasion), for electoral purposes, are in the same situation as the antebellum African slaves. "Representatives shall be apportioned ...counting the whole number of persons in each State, excluding Indians not taxed..."
But now the influx of illegal immigrants from Mexico and Central America has given rise to an entire new population whose have a similar lot. Frozen out of citizenship, their numbers are nonetheless included in the population of states who get to send a disproportionate number of Representatives to Congress, in order to pass laws that, among other things, ensure that their lot can never change. Let me say that I "get" both sides of this argument. I fully appreciate that those who immigrate to the US illegally are queue-jumpers, they necessarily compete for low-wage jobs that might otherwise go to those who are here lawfully, and many may have no loyalty to the country where they have chosen to live. On the other hand, I know a fair number of immigrants who have confided information to me such that I am virtually certain they did not immigrate lawfully. They are hard workers, they want a better life for themselves and their children, and they want their children to be integrated into US society (and for what it's worth most rooted for the USA in the World Cup either first or second). This is the classic American immigrant dream. Further, I "get" that the compromise behind the Immigration Reform Act of 1986 - amnesty for those already here, and tougher border enforcement to keep further illegal immigrants out - failed. The law was asymmetric. Once legalization happens, it is forever. But enforcement to ensure that the problem does not repeat is a chronic and permanent commitment, which is likely not to be enforced in large part due to employer desires for cheap labor. That being said, whatever the equities of an adult crossing into the US illegally, the same does not apply to a child who did not make the choice to immigrate, and for all intents and purposes, remembers no other home except the US, and feels every bit as much of an American kid as the great great great great grandchild of Irish, Italian, Jewish, or Japanese immigrants. There is no statute of limitations on being deported. Like murderers, who may commit the crime at age 18 and be convicted a lifetime later at 78, DREAMers - those young people who were brought here when they were young children, and know no other home - face a lifetime of fear and apprehension. Now they are college students and young adults, but even decades from now when they are 40, 60, or 80 years old, having married, raised a family, and worked for a lifetime, they will never vest in the privileges of citizenship, benefit from retirement programs, and at any moment's notice they will still be subject to arrest and deportation to a country where they were born but never really knew. This is simply unconscionable. Meanwhile, for those decades, those who want to deport them can claim their numbers for enhanced and unequal representation in Congress. This is abhorrent now, just as the 3/5's rule was abhorrent then. Representation should be based on the population eligible to vote. Further, simple humanity demands that there must be a Statute of Repose for the DREAMers. After some period of time those who were brought to this country illegally when they were children, who know only the United States as their home, should - regardless of any "path to citizenship" - at the very least have the right to remain permanently without fear of deportation.